Asia’s budget carriers provide an affordable way to access far-flung places like Bali or the Maldives, especially if you’re already visiting another destination nearby. However, those savings can disappear quickly if you overlook any of the fine print. TPG Contributor Katherine Fan took a last-minute trip through Singapore, Malaysia and Bali in October and learned several of these tips the hard way. Here are five things to keep in mind as you plan your own travels. While visiting Taiwan last fall thanks to this amazing United deal alert, I decided to tack on trips to several other Southeast Asia destinations while I was in the area. After a little cost analysis, I decided to save my limited award flights for later, turning instead to the local carriers I found through the ITA Matrix. Dozens of discount airlines compete for market share in the region, providing many flights that criss-cross East Asia all the way south to the Pacific Islands. AirAsia has been named the World’s Best Low-Cost Airline for the seventh consecutive year, although I found its main competitor, Tigerair, a subsidiary of Singapore Airlines, to surpass my expectations as well. TPG has covered several other low-cost carriers in the past as well as those in Australia and New Zealand in case you’re planning a larger overseas adventure. 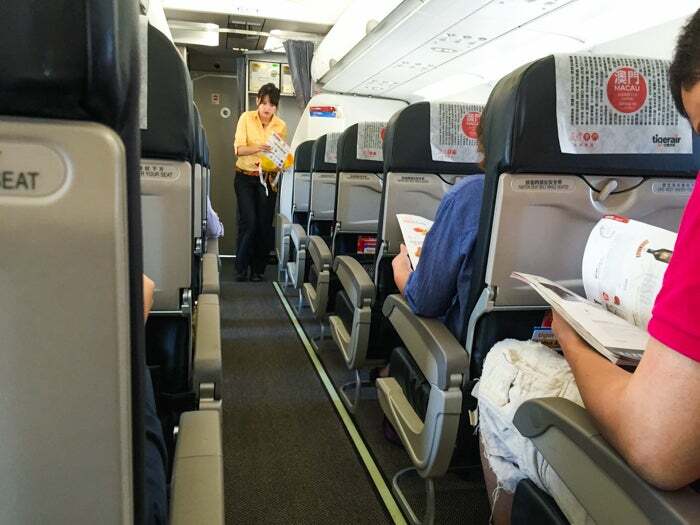 Here are five things you need to know before you book with low-cost carriers in Asia. Tigerair and AirAsia fares between Taiwan’s Taoyuan International Airport (TPE), Singapore Changi Airport (SIN), Kuala Lumpur International Airport (KUL) and Bali Denpasar Airport (DPS) typically undercut all the other carriers for the dates I needed, with both airlines offering at least one or two flight options each day. In addition, both airlines regularly offer additional discounts — for instance, waiting until Thursday to book travel during “Tigerflash Time” can save you up to an additional 30-40%. Tigerair frequently offers the lowest fares, but AirAsia’s nonstop routes can be much more convenient. One reason why Tigerair flights are so cheap is because many routes involve a lengthy layover in Singapore Changi Airport (SIN), typically between 10-28 hours. This is great if you want to pack in an overnight visit (check out this post to see why a stop in Singapore is totally worth it); just be sure to check your departure and arrival times carefully. In comparison, AirAsia offers significantly more nonstop routes between Asia’s major cities. While AirAsia also directs many of its smaller flights through Singapore as well, the layovers simply weren’t as extreme as those I found on Tigerair. Asia’s budget carriers are also known for holding low priority on the runway, so expect to wait on the tarmac for other aircraft to depart first if your airport experiences weather-related delays. Make sure you build extra buffer time into your itinerary to accommodate unforeseen circumstances, especially if your next leg of the trip is through another airline — with fares this low, you won’t be offered standby options on a later flight should you miss an especially tight connection. With so many flights passing through Singapore Changi (SIN), it’s extremely important to know the rules so your budget travel adventure doesn’t end up costing you more than you planned. When you fly into Singapore on one budget carrier and depart on another, you will most likely need to exit and go through immigration and customs, collect your luggage and then re-enter via the transit area, even if your flight out of the country departs in just a few hours and you don’t plan to leave the airport. TigerAir and its affiliates are a notable exception to this rule, and this only applies if both your arrival and departure flights are through the airline or its partners. Unfortunately, I made the mistake of flying into Singapore (SIN) on AirAsia in the morning with more than three hours to kill before flying out on Tigerair in the afternoon. Thinking I was already in the right terminal for departure and not taking into account the fact that I had flown into the country on another carrier, I didn’t bother going through immigration and customs even though I had plenty of time to do so. As a result, I ended up having to pay a $40 SGD ($28 USD) processing fee at the Tigerair help desk to expedite my immigration before I could acquire my boarding pass — the alternative would have been to exit the terminal, go through immigration and customs, and most likely miss my flight. 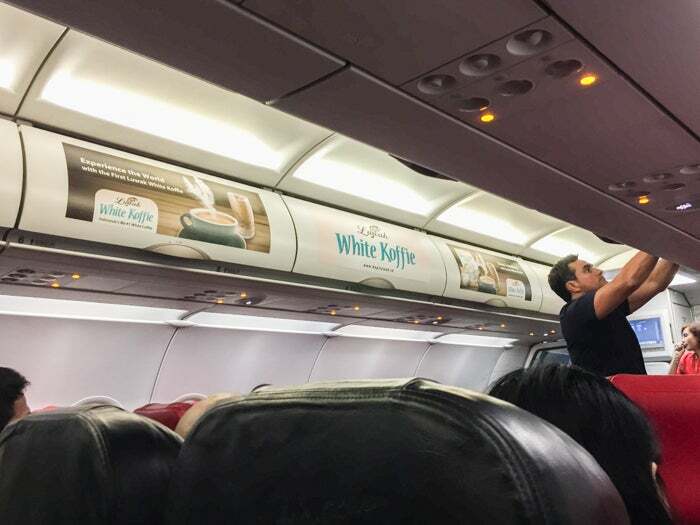 On-board advertisements provide an additional source of revenue for low-cost airlines like AirAsia. Budget airlines are notorious for tacking on hidden fees to boost their bottom line price, although you can avoid many charges with a little bit of advanced planning. Make sure you know exactly how much weight you are allowed for your carry-on. For example, Tigerair allows you a total of 10 kg for carry-on weight, but AirAsia limits passengers to 7 kg, so if you plan to travel on both airlines, you’ll have to limit yourself to AirAsia’s lower allowance. The baggage allowance phrasing on AirAsia’s website is a little bit ambiguous, permitting a small personal item such as a laptop bag or a purse in addition to your carry-on, although it’s pretty clear that the intent is to limit you to 7 kg total. If you end up with a few more souvenirs than you expected, you can get clever with the wording by putting your heavier items into your laptop bag and offering up your carry-on item to be weighed if necessary. Note that carry-on luggage seems to be checked at random so it’s likely that you won’t be flagged for a baggage weight check unless your flight is packed. To play it safe, frequent travelers suggest pre-purchasing more check-in baggage weight allowance than you think you need, since additional luggage fees are much pricier at the check-in counter. If you’re trying to save time or money by avoiding checking luggage altogether, make sure you limit your luggage to the maximum weight allowed by the strictest airline in your itinerary. If you think you may want a meal in-flight, go ahead and make the purchase while you’re booking. Not only will you lock in your choice ahead of time at a discounted rate, but you’ll also get served first on the flight. Most of my flights seemed to stock five portions of each option; passengers who bought food onboard had to choose from whatever was left after the pre-booked meals were served. A typical meal on AirAsia or TigerAir will set you back anywhere from $4-10. Drinks are provided a la carte. Meals cover a wide range of cuisines — predominantly Asian dishes such as Hainanese chicken over rice or curry lamb — but also include more Western fare like pasta and salads. All of the meals I tried were surprisingly edible and filling, especially compared with economy class offerings on larger carriers like United Airlines. Unlike domestic budget airline carriers such as Southwest, you might not be allowed to bring non-airline food on the plane. 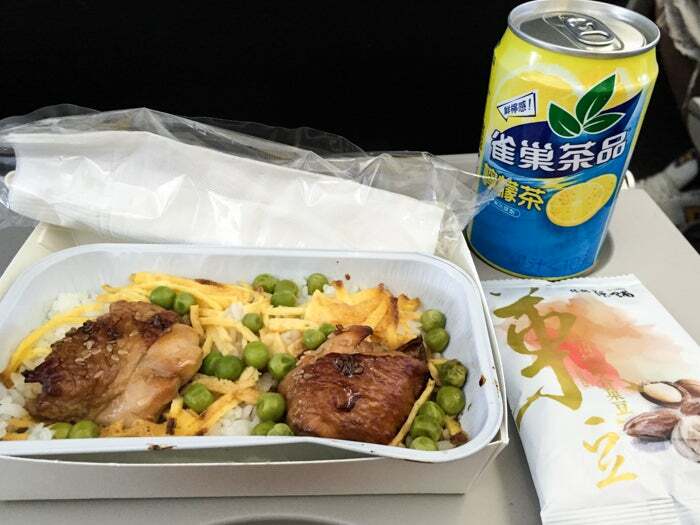 During my TigerAir flight from Taipei (TPE) to Singapore (SIN), a flight attendant apologetically told me that outside food was not allowed and asked me to finish my meal quickly before she would have to confiscate it. Both AirAsia and Tigerair offer in-flight duty-free shopping on certain routes and I was able to purchase food and drinks using my Chase Sapphire Preferred Card on those flights. However, flights without on-board shopping may be cash-only, so it’s a good idea to keep some cash in at least one local currency on hand just in case. Tigerair offers in-flight duty-free shopping on select routes. On my AirAsia flight from Kuala Lumpur (KUL) to Bali (DPS), I had planned to buy dinner on the plane but didn’t realize that my credit card wouldn’t be accepted on board. Since I had carefully rationed out all of my Malaysian ringgit and didn’t have any Balinese rupiah on hand yet since I had planned to hit up an ATM when I landed using my Charles Schwab debit card, I had no way to purchase food or beverages because they wouldn’t accept either my Singapore or US dollars. In fact, I couldn’t even refill my empty water bottle — AirAsia did not offer any drinkable tap water so the flight attendant eventually took pity on me and offered a cup of hot water from the tea kettle. I found water fountains in Kuala Lumpur (KUL) to be few and far between, so I had not filled up as much as I probably should have. If you enjoy kicking back with a beer or cocktail before flying, you should also know that some Islamic countries have semi-dry or completely dry airports. While departing from Kuala Lumpur (KUL), I wasn’t able to find a cocktail anywhere in KLIA2, the airport’s new low-cost carrier terminal. Similarly, the in-flight menu for my AirAsia flight didn’t even offer alcoholic drinks for purchase, even though the airline carries beer and wine for other routes in the region. Also good to know: Malaysia’s draconian drug laws state that even a tiny amount of marijuana can incur the death penalty, so don’t even go there. 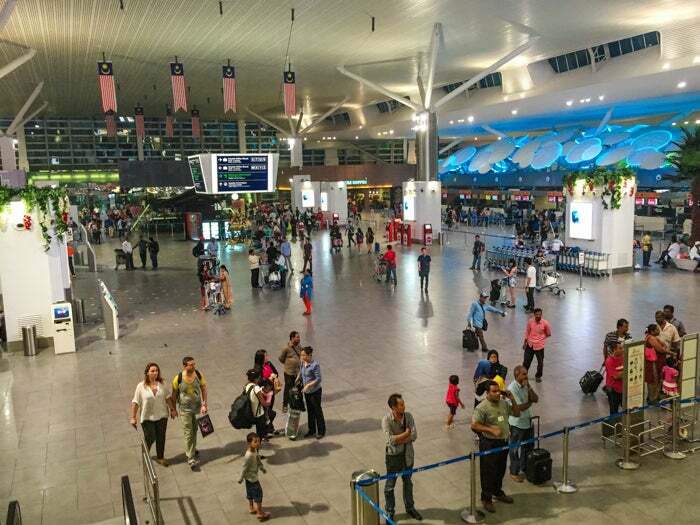 Kuala Lumpur’s KLIA2 low-cost terminal is the world’s largest specifically built for budget carriers. All things considered, both airlines provided me a very comfortable experience for the cost — definitely superior to domestic carriers like Southwest Airlines in terms of on-board variety for shopping and dining. However, keeping track of individual country requirements can be stressful so the added inconvenience may not be for everyone. Personally, I appreciated the chance to see three different countries for under $400 and would not hesitate to fly either airline again. 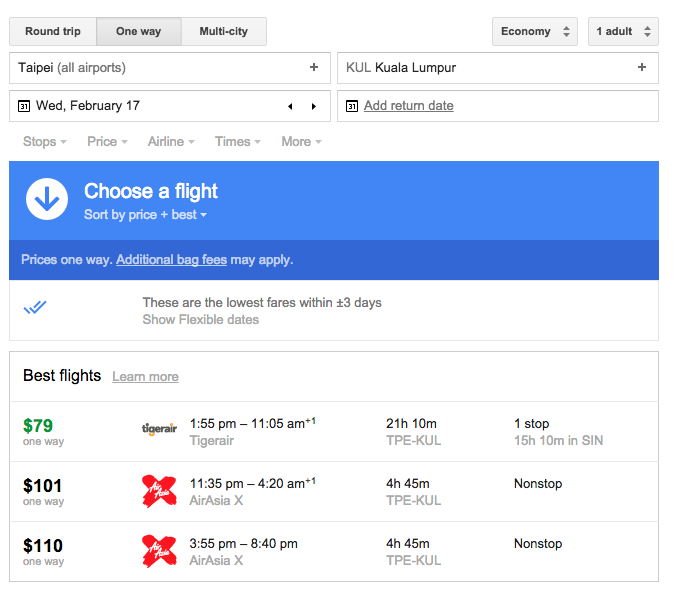 Would you consider flying low-cost carriers in Asia? Share your travel tips in the comments below.